A View From The Hook: Activity at the Atlantic Basin - Visit the Expedition Vessel "Wanderbird" - 4pm and 7pm Saturday, Nov. 20th - FREE! 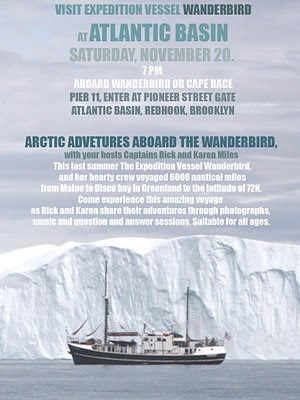 Activity at the Atlantic Basin - Visit the Expedition Vessel "Wanderbird" - 4pm and 7pm Saturday, Nov. 20th - FREE! 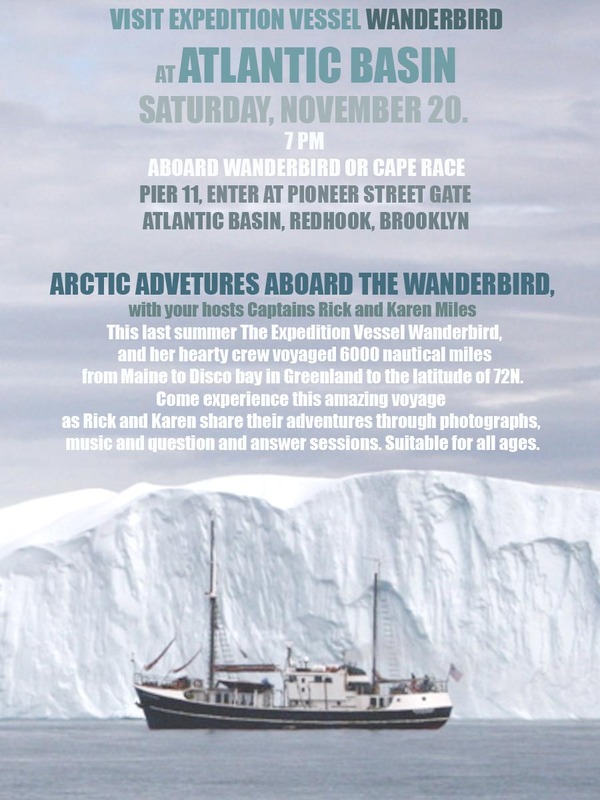 This Saturday, November 20th, in an event staged by the NYC Economic Development Corporation, there will be the opportunity to visit the expedition ship "Wanderbird" while also vicariously experiencing the Arctic seafaring adventures of the hosts, Captains Rick and Karen, who will be sharing their tales through Q and A, photos and music. The "Wanderbird" will be moored in the Atlantic Basin /Pier 11 at the bottom of Pioneer Street in Red Hook, Brooklyn - the stunning and historic location where PortSide New York held its successful series of events over the Summer (and its future permanent home). On Saturday there will be two opportunities to board the visiting vessel - one at 4pm and later at 7pm. The EDC has passed on the information that at 4PM there will be a show for the "younger set" that will be held inside the Brooklyn Cruise Terminal. Then, everyone can visit the boat. So hope to see you there for this free, family friendly event. It's another opportunity to experience the waterfront that is literally at our doorstep. Another chance to see and imagine what more is possible on our waterfront. And, as an added bonus, it may be an opportunity to experience the Cruise Ship Terminal, that has been, up to now, mostly only accessible to cruisers .... (and 4,500 conference-attending rabbis). I trust that NYC Chemists would know how to break down the NOx and SOx into "friendly" air to breathe in. As far as I know, people go intentionally to sulphuric sources and take sulphuric baths for health purposes. Surely, our scientists would know how to convert a harmful chemical into a beneficial one.